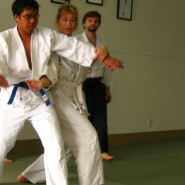 Many have the misconception that they have to be or look a certain way in order to take Aikido martial arts training. The REAL tall and short of it is this… Aikido is for all ages, all sizes, all fitness levels, all “weight classes”, men, women and children. Because Aikido does not rely on directly confronting strength with strength but rather emphasizes skilled maneuvering, it enables a small person to effectively control a large person. A 60-year-old woman can control a 20-year-old man; a less strong or lightweight person can control a stronger, heavier opponent. Through the precise use of leverage, inertia, gravity, timing and the action of centrifugal and centripetal forces, it is ultimately the energy of the attack itself which brings down the attacker. The physical skills of Aikido include entering, blocking or avoidance movements, followed by throws or holds. The system works because each person’s power is optimally utilized to lead the opponent in circles. The opponent essentially throws himself. So, now what’s holding you back? Request a free class or stop by the dojo during a class to observe!